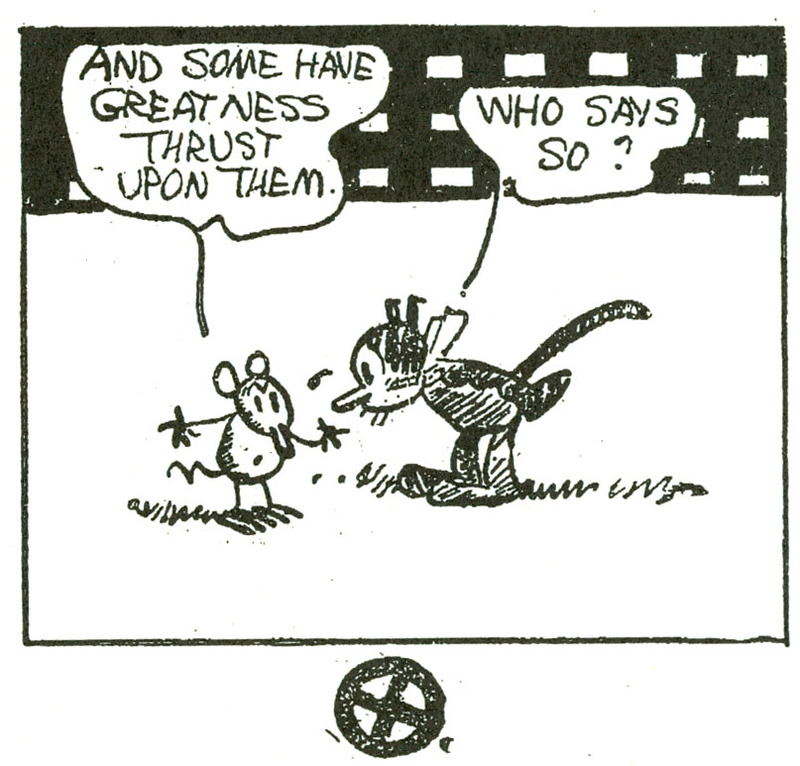 CATS IN COMICS: Krazy Kat by Gene Kannenberg, Jr.
As ever, the strip’s conceit: Ignatz Mouse, the antagonist, has it in for Kazy Kat, the sometimes-he, sometimes-she protagonist; Ignatz expresses his disdain usually in the form of a brick hurled at Krazy’s head. 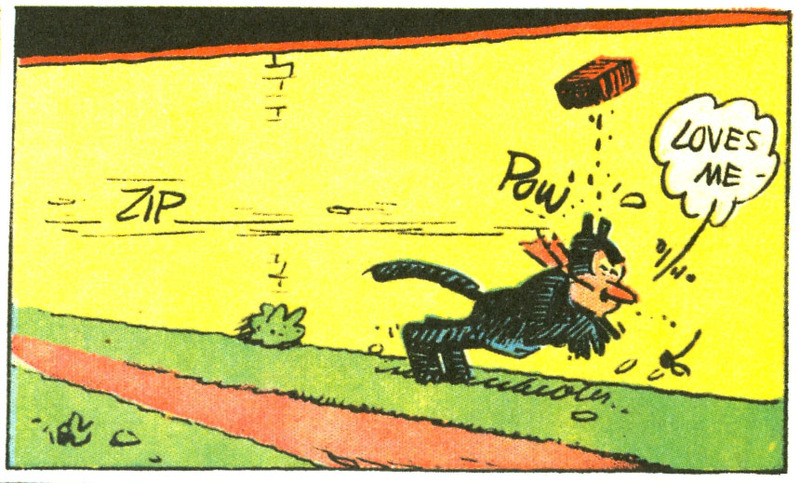 Krazy, in love with Ignatz, sees the brick as a sign of affection. Offissa Pupp, the local constabulary, is in love with Krazy and despises Ignatz. Many strips end with Pupp putting Ignatz in jail for his crime. It’s all that simple, and that complex – variations on a theme for four glorious decades. It’s almost a cliche to say that the strip is “poetic,” but really, honestly, I don’t know of a better word. Herriman’s use of language, pulsing with puns and patois, is lyrical in and of itself. But look at the strip as a whole: each installment, especially each Sunday page, is a perfect little gem of an object, with visuals that are as malleable, marvelous, and magnificent as any sonnet. Form and meaning walk hand in hand in Krazy’s hometown of Coconino County. I’ve seen it said at times that Krazy is delusional, or that she doesn’t understand Ignatz’s intentions. But I think that such ideas miss the point. Like a “real” cat*, Krazy creates hir own reality. Anyone who’s lived with an actual feline knows that, try as you might, you cannot control, cannot master a cat. Cats are subject to their own internal wants, needs, and whims; sometimes, rarely, these impulses correspond to what we want, and we then find this behavior charming and “cute.” But really, it’s the cat who’s calling the shots. So, too, does Krazy call the shots – literally: she calls the shooting bricks love tokens. So what if Ignatz doesn’t mean them that way? Ultimately, and to our benefit, it’s what Krazy desires that kounts. * I use the “scare quotes” hesitantly; to me, Krazy is as real a creation as is possible. Nothing fake; all genuine. All Art. Many thanks to our guest blogger Gene Kannenberg, Jr. for this wonderful post. BIO: Gene Kannenberg, Jr. is the director of ComicsResearch.org. Formerly the Chair of both the International Comic Arts Festival and the Comic Art & Comics Area of the Popular Culture Association, he has written widely on comic art. His book “500 Essential Graphic Novels” was published in 2008. This entry was posted in Art, Cats in Comics, Comics and tagged brick, cartoons, cats, Coconino County, comic strip, Gene Kannenberg Jr., George Herriman, Ignatz Mouse, Krazy Kat, Offissa Pupp, patois, poetic, puns, Sunday pages by Doctor Comics. Bookmark the permalink. Sorry about that. I shall take a look at your SEO suggestions and see if I can improve things here. Thank you for your suggestion but I have an excellent scholar here writing original content.